The Constitution Bench of the Supreme Court finally delivered the Judgment in a batch of appeals resolving the conflict between many two and three Judge Benches of the supreme court and various High Courts regarding the scope and ambit of powers of the Criminal Court regarding adding additional accused in a Criminal case Courts interpreting Section 319 of Code of Criminal Procedure, 1973. (1) When the power under sub-section (1) of Section 319 of the Code of addition of accused can be exercised by a Court? Whether application under Section 319 is not maintainable unless the cross-examination of the witness is complete? The reference was desired to be resolved by a three- Judge Bench where-after the same came up for consideration and vide order dated 8.12.2011, the Court opined that in view of the reference made in the case of Dharam Pal & Ors. v. State of Haryana & Anr., (2004) 13 SCC 9, the issues involved being identical in nature, the same should be resolved by a Constitution Bench consisting of at least five Judges. The Bench felt that since a three-Judge Bench has already referred the matter of Dharam Pal (Supra) to a Constitution Bench, then in that event it would be appropriate that such overlapping issues should also be resolved by a Bench of similar strength. Reference made in the case of Dharam Pal (Supra) came to be answered in relation to the power of a Court of Sessions to invoke Section 319 Cr.P.C. at the stage of committal of the case to a Court of Sessions. The said reference was answered by the Constitution Bench in the case of Dharam Pal & Ors. v. State of Haryana & Anr., AIR 2013 SC 3018, wherein it was held that a Court of Sessions can with the aid of Section 193 Cr.P.C. proceed to array any other person and summon him for being tried even if the provisions of Section 319 Cr.P.C. could not be pressed in service at the stage of committal. A. In Dharam Pal's case, the Constitution Bench has already held that after committal, cognizance of an offence can be taken against a person not named as an accused but against whom materials are available from the papers filed by the police after completion of investigation. Such cognizance can be taken under section 319 Cr.P.C and the Sessions Judge need not wait till 'evidence' under Section 319 Cr.P.C. becomes available for summoning an additional accused. Section 319 Cr.P.C., significantly, uses two expressions that have to be taken note of i.e. (1) Inquiry (2) Trial. As a trial commences after framing of charge, an inquiry can only be understood to be a pre-trial inquiry. Inquiries under Sections 200, 201, 202 Cr.P.C. ; and under Section 398 Cr.P.C. are species of the inquiry contemplated by Section 319 Cr.P.C. Materials coming before the Court in course of such enquiries can be used for corroboration of the evidence recorded in the court after the trial commences, for the exercise of power under Section 319 Cr.P.C., and also to add an accused whose name has been shown in Column 2 of the chargesheet. In view of the above position the word 'evidence' in Section 319 Cr.P.C. has to be broadly understood and not literally i.e. as evidence brought during a trial. Q.V Does the power under Section 319 Cr.P.C. extend to persons not named in the FIR or named in the FIR but not chargesheeted or who have been discharged? A. A person not named in the FIR or a person though named in the FIR but has not been chargesheeted or a person who has been discharged can be summoned under Section 319 Cr.P.C. provided from the evidence it appears that such person can be tried along with the accused already facing trial. 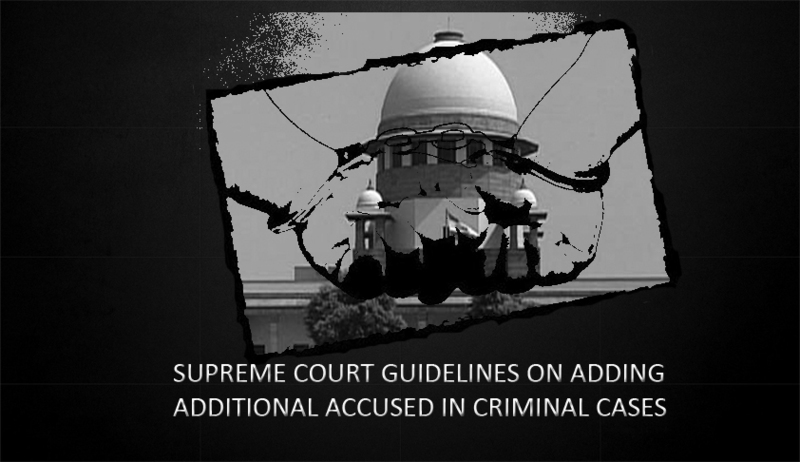 However, in so far as an accused who has been discharged is concerned the requirement of Sections 300 and 398 Cr.P.C. has to be complied with before he can be summoned afresh.